TXT files with Source and Target. A PS file with mail settings. 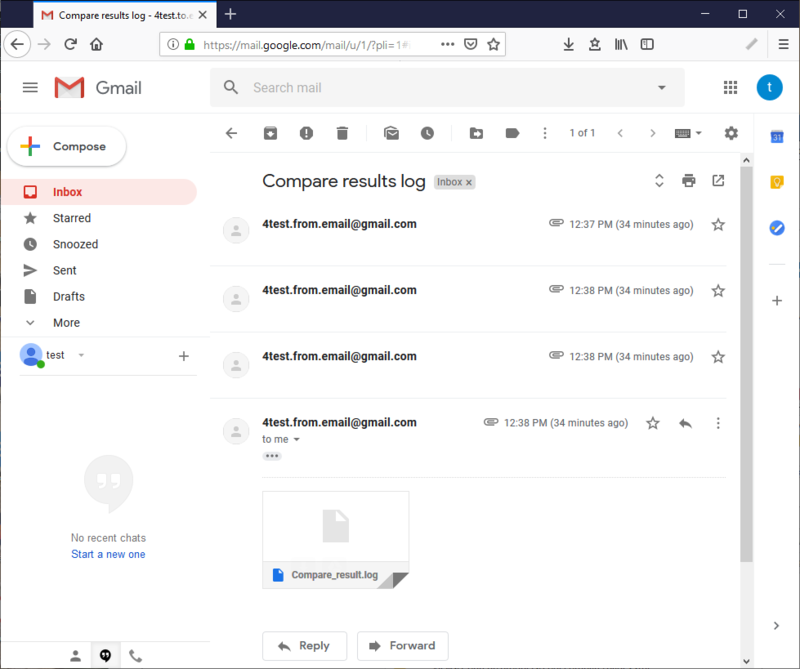 A BAT file to run both, comparison and mail delivery. Save the new TXT file. Note that to illustrate the failed comparison scenario in this article, we have intentionally included the databases that do not exist (test_database and dev_database from DBMSSQLx64\MSSQL2014). Next, we need to configure email settings for both, sender and addressee. For this, we need to create a Windows PowerShell Cmdlet file ( .ps1). It’s a script, that contains a series of lines written in the PowerShell scripting language. Open a plain text editor such as Notepad. $emailFrom = “email_from@test.com” – specify the sender email address. $emailTo = “email_to@test.com” – specify the addressee email address. $subj = “email_subject” – specify the mail subject. $body = “” – specify any text for the mail body, if required. $file = “path_to_file” – specify path to the log file. $smtpServer = “” – specy the SMTP server of your mail service. Save the file with the PS1 extension. Finally, we can put everything together, and create an executable BAT file to run the chief task via the command-line interface. 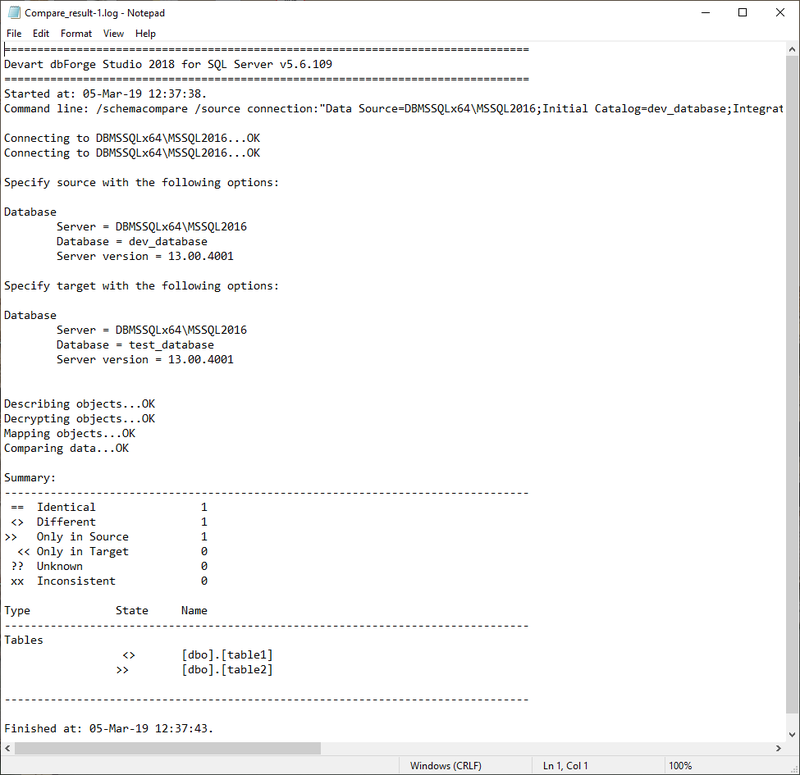 Set Compare="C:\Program Files\Devart\dbForge Studio for SQL Server\dbforgesql.com"
Source_Servers_and_DBs.txt is the name of the file containing source connections. Target_Servers_and_DBs.txt is the name of the file containing target connections. 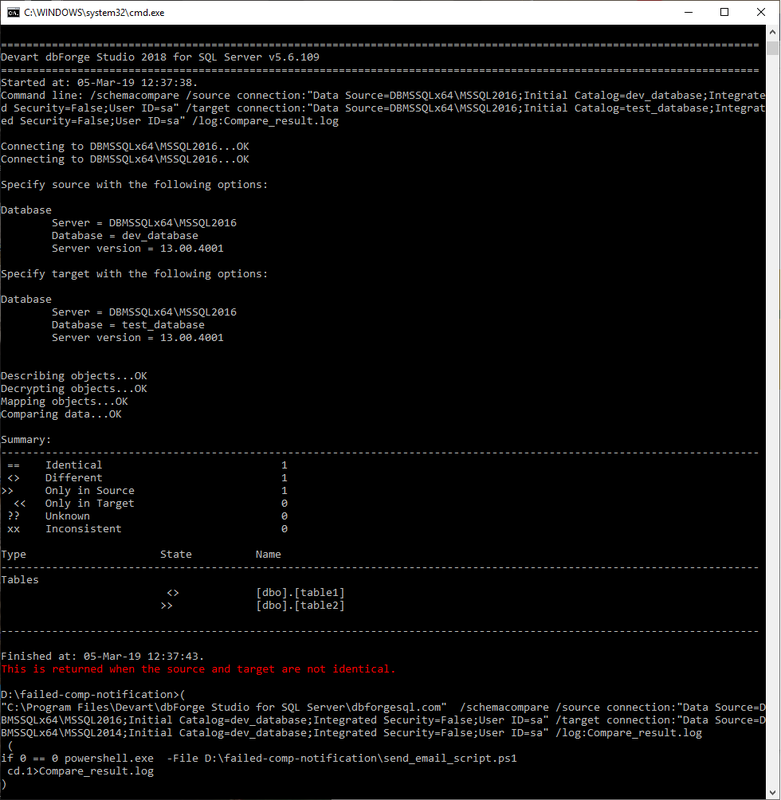 D:\temp\sync_to_mail\PowerShell\send_email_script.ps1 is a location and name of the script with mail settings. We will not explain all aspects of the command-line syntax in this article. For more information, refer to the product documentation. Save the file with the .bat extension. Now we have anything we need. Let’s run the created bat file and see what happens. As for the rest three comparisons, all of them feature non-existing databases in Source or in Target. Thus, they all resulted in the generation of the error. In all these cases, the corresponding log file has been generated and sent to the specified email address. In this article, we provided a solution for automatic delivery of schema comparison log files to an email when comparing schemas of multiple SQL Server databases. To complete this task, we created a bat file that copes with the task in a single click. Further, we can create synchronization task in Windows Scheduler, and the process will become a 100-percent automatic. The command-line functionality of dbForge Studio for SQL Server provides a bunch of options and possibilities for customizing schema comparison to your specific needs. 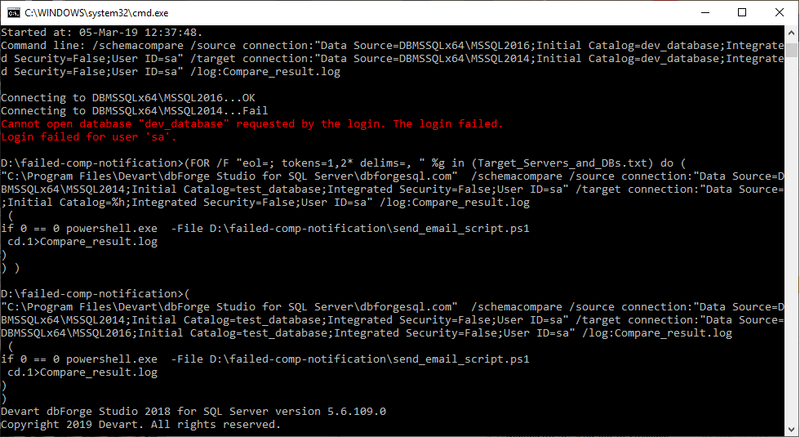 Try dbForge Studio for SQL Server and check how it can help you in your DB tasks.